NGD Interiors has moved! Yay! While our address stays the same, we have moved out of the Harry Potter closet and into a bonafied studio. We had a barn on our property that had been deemed the “shed”, which was an old wagon barn with an upper hay loft. We also deemed this shed as the Harry Potter tent. What does that mean for non Harry Potter fans? It means that from the outside this wagon shed looked small, dollhouse like, and barely big enough to fit anything. But once you stepped inside, it became surprisingly large. 16’ ceilings to the center peak and walls measuring 18 ’x 14’-bigger than some New York apartments. 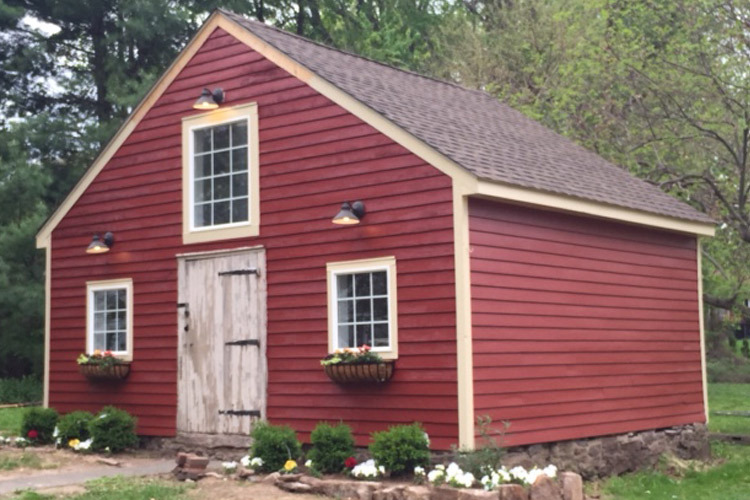 Formerly an old wagon shed/hay barn, this barn was the future studio for NGD Interiors studio space. It was dark, creepy, rundown and had wild animals living it. Sounds cozy right? When we bought the property, it was always our intention that this would be my studio space. I had a temporary, make-shift office space with limited storage under the stairs that we called my Harry Potter closet. While this worked, I couldn’t wait for the day that my office would be completed and I had a real space for clients, vendors, and employees. Temporary office under the stairs that we nicknamed the Harry Potter closet. At this point, the only visitors that I accepted where of the animal kind. Butterscotch & Claira take their jobs seriously as paperweights. Earlier this year, we had plans for the stuido to be completed since the previous year we were able to get quite a few projects done. We had a new roof put on, which helped the building not become any more rundown. Before-NGD Interiors Studio – there was an impromptu skylight and other areas of the roof were compromised, leading to deterioration of the barn. During – NGD Interiors Studio – the new roof made a huge improvement over the previous moss grown roof. Inside, we took out the old loft and stairs. The loft was too short to stand up in and under the loft you clunked your head on the low hanging beams. It was great for hay, but not great for my studio. Before- NGD Interiors Studio – the concrete floors had seen better days, the loft was made with make-shift materials and was too low hanging. The next step, closing in the side of the shed so that wild animals could no longer make it their winter home. Before – NGD Interiors Studio – view of loft and open exterior. Before- NGD Interiors Studio – the side exterior was wide open and the roof was in need of replacement. While I would have loved to put in french doors into this area, the overhead beam was low and would not allow for anything tall enough. As it was, we put the windows as high as the beam would allow. During- NGD Interiors Studio – the windows were being framed in and the roof had been replaced. We started knocking out the dilapidated concrete floor. During- NGD Interiors Studio – the concrete floor was being knocked out. At this point, we decided that we didn’t want to do any of this work ourselves anymore and called in the contractors. I think it was hilarious to look back at several contractors that said you want to do what!?…. I wanted exposed beams, a chandelier, high ceilings, and I was not compromising. One contractor suggested that I put in a lowered ceiling with tiles… really, I think not. Chandeliers don’t look good hanging from ceiling tiles. Before – NGD Interiors Studio – the barn had a partial loft, a roof that was falling in & windows that were falling out. The fluorescent work light was where I envisioned my chandelier. During – NGD Interiors Studio -the barn in the winter, waiting for construction to begin. and the fact we didn’t see eye to eye, we had to part ways. By this time it was mid July/August and I was saddened as the goal was to get into the studio by spring. Due to other things, we had to put the project on hold and it didn’t look like this was the year. Late fall, we decided to restart the project and look for new contractors. We found a crew that was fantastic and who had experience doing unique projects that weren’t cut and dry. Within a couple of days of signing the contract, they had the space framed out. We got the electric in, and they were back to finish the insulation & drywall. At this point, it was just two days before Christmas. What a great gift! We spent Christmas break trimming out windows, painting, and laying the floor. Sherwin Williams – Snowfall-the perfect paint color for the design studio. It was agonizing choosing the right white. The new color was going on smoothly. We used Sherwin Williams “Super Paint” all in one primer & paint. I used a luxury vinyl plank on the floor. My heartest of hearts wanted a specialty floor that I eyed at they New York Architectural Digest show a couple of years back. However, my dreams were dashed when they told me I didn’t have enough square footage. I toyed with adding a wood floor, but I would have had to add a wood substrate on top of the concrete and due to my door being a “hobbit” height door I couldn’t take any extra height off of the overall opening with extra height on the flooring. I went with a commercial grade vinyl plank flooring and am very happy with the results. NGD Interiors Studio Floor – the vinyl plank floor came out better than anticipated and was easy to install. I wanted to point out another set of major modifications that came, which was the replacement of the windows. We replaced the two front windows to match the new side windows. When we first bought the house, there were two large evergreen bushes in front and we didn’t even know that the shed had windows. Later, we had to dig the stumps out with the tractor and they were massive! While the upper hay door was really cute, I had always wanted to put a window in that area, as I needed as much natural light as I could get and I wanted to show off my chandelier. I originally had intentions on keeping the door, but after inserting the new window, we held the door up in the open position and unfortunately didn’t do anything aesthetically for the outside of the space. During – NGD Interiors Studio – the old hay door was replaced with a new window that allowed light into the space. When it was finally time to install my chandelier, I literally was clapping and hopping up and down because I was so excited! It signaled that not only had I come a long ways from the small space under the stairs, but my studio had reached the peak of its transformation. NGD Interiors Studio – it was an exciting time to see my chandelier being installed. The outside received an overhaul with new boxed in eaves, window trim work, cedar siding and was dressed up with new lights. We will paint in the spring, but unfortunately it is too cold to paint any sooner. (Current State) -NGD Interiors Studio – new windows, roofing, and trim work were completed on the exterior of the studio. We have to wait until spring to paint. I spent my first work day of the new year in the new studio. I don’t have everything moved out yet, but I have big plans! After-NGD Interiors Studio. The front has had windows replaced, features exposed beams, and soaring ceilings for the chandelier centerpiece. After-NGD Interiors Studio Side. The gaping hole was enclosed with two windows. There will be a seating area under the window with draperies, rugs, & beverage area. Eventually there will be a full patio & gardens on the exterior. After-NGD Interiors Studio- Side View. Tables and chairs are under the T.V. perfect for client presentations & viewings of their space. The T.V. is bluetooth connected to the sound system, computer and personal electronics. After-NGD Interiors Studio Back Wall. The back wall is 12′ feet high and 18′ long. We had a Mitsibuishi split system unit installed for heating & cooling. It will house bookcases and shelving during the time being, but I will eventually have my cabinet line, Nina Green Signature Series cabinetry, floor to ceiling. My next project will be getting a new front door. I am having a dutch door with a window at the top custom made to fit the awkward opening. Nina is exceptionally talented - and brings tremendous creativity and passion to our project. She is an active, astute, listener, who can "read between the lines" to get a true measure of what's being asked. The result: a quality of work that is unmatched.